Giant Easter Eggs...Say what?!! Who doesn't Want One? Ah Easter eggs…Memories of chocolate goodness. 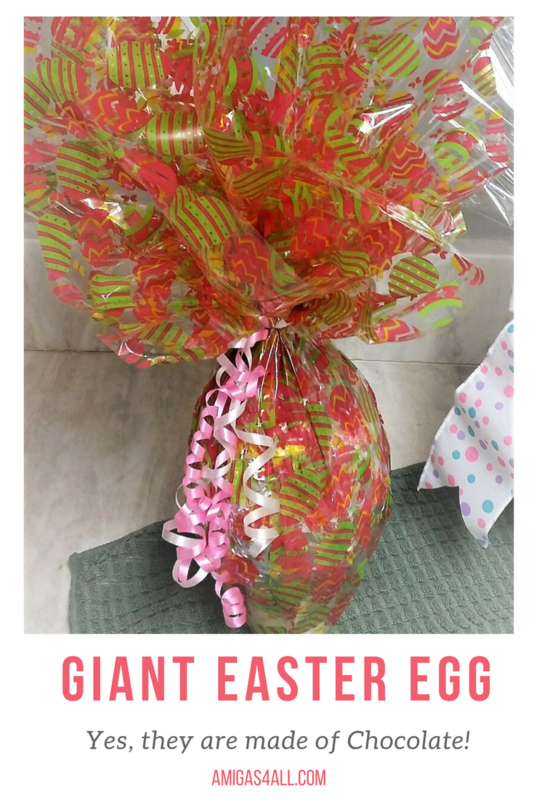 Every year, as long as I can remember, Easter time meant that for a whole month or so supermarkets would be filled with giant Easter eggs all over the aisles. Hanging on top, sides, bottoms, EVERYWHERE. But what land do I speak of that would have such legendary eggs…Well, Brazil! You ask: the land of Samba and Carnival? That’s right! Children of all ages (that includes adults) love to get these eggs. They are magical. They come in white, dark, semi-sweet chocolate, with nuts, coconut, rice crispies and more. How can that be? And how can I get my hands on those things? In Brazil, they are pretty pricey. Imagine you can buy a 300g chocolate bar for $5 but a 300g giant egg costs about $50! Another thrifty option is to make them! How? I will show you how. So gather your little ones (or big ones) and feast your eyes for we are about to make Giant Easter eggs!!!!!! The first challenge is to find a mold. Lucky for me, before I moved to these lands I brought my collection of molds. These are plastic molds that I bought in a baker supply store in Brazil. But fear not! After doing some digging I found some cool Easter Egg molds on Amazon (gotta love that site for unusual stuff like this!). Here are some more styles of molds I had on hand. Before you start doing anything put the mold in the freezer. You want it very cold before the chocolate goes in. The next thing you will need is chocolate for bakers. DO NOT use a regular chocolate bar for molding chocolate because it will stick to the mold and it will never come off. Then decide how big or heavy you want your chocolate egg. For this tutorial I went with 6 chocolate bars (175g each). With them I can make three eggs. One of about 175g and two of about 200 or so. Break them into pieces and put them in a metal bowl. Break them into pieces and put them in a metal bowl. The next thing is melting the chocolate. Some people like the microwave method of melting chocolate (30s in the microwave) I prefer the water bath method. It takes a little longer to melt but I have more control on the temperature and also more time to work the chocolate. Plus I think the final result is a shinnier chocolate. In the water bath method you simply use a pan or baking pan to boil some water then another bowl with the chocolate goes on top of that water bath for a slow melt. When the water boils, turn it off. Wait until the steam stops rising and then put the bowl with the chocolate pieces inside the pan with water. Stir slowly avoiding any steam from landing on the chocolate. The biggest challenge here is not eating the chocolate! HA! Once the chocolate is melted you c an get another bowl with ice in it and you can put the bowl with the melted chocolate on top of the ice so you can give it a “thermal shock”. Stir the chocolate to cool it to the point where you put a little dab of chocolate on your lip and it feels cold but still liquid. That’s when the magic begins! Use cutting boards or cookie sheets lined with wax paper (plastic film can work too if you don’t have anything else) as your surface. If you work directly on the board or cookie sheet you will have a tough time removing the mold once it hardens. Grab the molds from the freezer and put a few spoonfuls of melted chocolate inside your mold and move it around so the chocolate reaches all the surfaces inside the mold. You can use a spoon or a kitchen brush to spread the chocolate too. Make sure that there is enough chocolate to cover the whole surface (not too thin but also not too much that it will run down the mold). Once the inside is all covered in chocolate, flip it upside down onto the baking pan or lined board. Put the molds in the freezer right away so the chocolate hardens. Give it about 15 minutes and bring the molds out of the freezer. Repeat the process to add another layer of chocolate. This will make the egg thick enough not to break easily and hold whatever goodies you want to add inside. This time wait at least 20 minutes. Bring the molds out of the freezer and only attempt to take the eggs out of the mold if you see that the chocolate is finally “unsticking” (also not a word?) out of the molds. See the lighter part on the bottom right of the picture? Notice the top is darker? That means it’s not ready to pop. Only when the whole thing looks like that bottom part then you are ready to get the egg out of the mold. Sometimes I keep them in the freezer a little longer and they will pop right out. Just be patient. See how pretty they are? 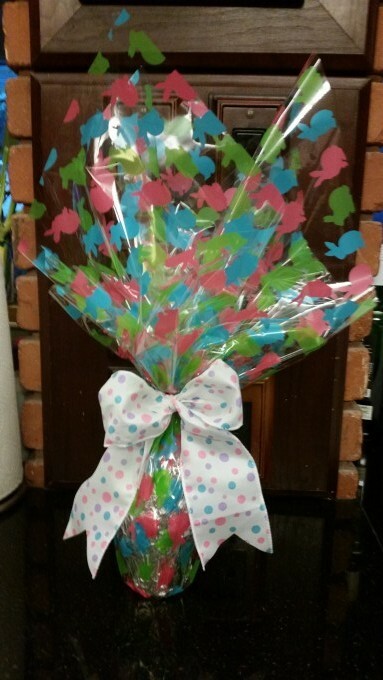 Once the Easter eggs are out of the mold you can add bonbons or bite sized chocolates or candy. The sky is the limit! Even toys are an option. Just make sure no one chokes on them! I also like to add a little “pedestal” so the eggs stay up for a better and more enticing presentation. The original eggs from Brazil come with a little “plastic pedestal” to make the egg stand up but you can make your own pedestal with a paper or plastic cup. Just cut it down in half or just enough to fit the bottom of the egg so it is stable (see pics below). 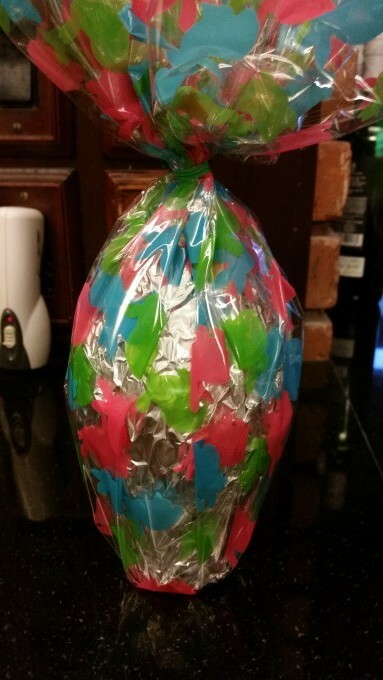 The next step is to wrap the egg in cellophane or any fancy plastic wrapping you prefer. Simply put the egg in the middle of the roll of paper and measure so you have a large square. Grab the longer ends and bring them together. Then bring in the shorter ends together making sure that the folds are neatly gathered. You can use tape, string or bread ties to tie it all together. Then add a pretty bow, curling ribbon, sisal string and voila! Giant Easter Eggs!!!!! Follow us on Facebook and Pinterest for more projects and decor ideas. And don’t forget to sign up below for our email list for news and updates. Sign up and you will receive a free budget estimator for your next remodeling project. It includes space for drawings, measurements, and price comparison so you can make sure you stay within budget. Easter is coming… Are you ready for Dragons Eggs?